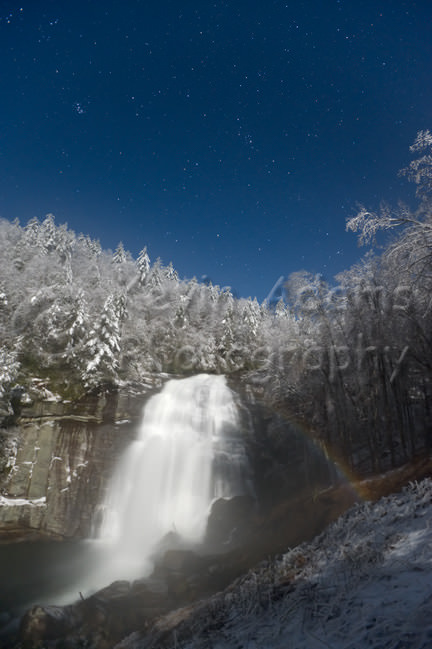 I've been trying to see and photograph the moonbow at Rainbow Falls for 25 years. A moonbow is different from a rainbow only in that the light being refracted and reflected comes from the moon instead of the sun. So most anywhere that you can see a rainbow, you can also see a moonbow if the conditions are just right. The right conditions at Rainbow Falls on Horsepasture Wild & Scenic River in North Carolina mean a lot of water to produce heavy spray and a clear night within a couple days of the full moon. After 25 years of trying, everything came together recently and I finally got my moonbow. Trouble was, the conditions happened to come together when the temperature was 15 degrees Fahrenheit and the only position from where I could see the moonbow was standing directly in the brunt of the heavy spray. For 45 minutes I stood in that spray making 20-second exposures. After the first two or three shots, the lens cooled to the point where the spray instantly froze on the front element of the lens. My routine was to make the exposure, swing the lens away from the spray (I kept the pan base of the ball head loosened so I could quickly swing it around), breathe heavily on the lens to melt the ice and warm it enough so I could wipe the water off before it refroze, make adjustments in exposure or focusing, quickly swing the lens back around and shoot again. The reason I shot so many exposures was because after shooting a few shots I started to become concerned about the focus. I just couldn't seem to get it right, no matter what I tried. The waterfall was far enough away that I figured infinity focus would suffice, so more than once I took the camera off the head, autofocused on the moon behind me and taped the ring in place. But when I magnified the image on the LCD it never looked totally sharp. So I kept making adjustments, bracketing focus just as I might bracket exposure back in the film days. When I finished after 45 minutes, a thin layer of ice covered my clothes, the tripod and the camera. Caught up with getting the shot, I didn't really notice the cold while shooting, but once I walked away it quickly hit me. I was cold! But I had the shot. I hoped. I didn't know if I had gotten a properly focused shot until I viewed the images on the computer later that day. As it turned out, the only photos from the shoot that had acceptable focus were the first couple that I shot before the spray started freezing on the lens. Once the ice started, nothing I did was going to make the image work. If only I had known that at the time! In the accompanying image you can see that the 20 seconds of spray did cause the image to appear soft, but not unacceptably so. Only when the spray began freezing did it cause severe image blur. So I learned a photography lesson and was reminded of a basic scientific principle. When it's fifteen degrees outside and you add water, ice happens. If it happens on the front element of a lens, softness happens. Not one to accept photography lessons and basic scientific principles without a fight, I'm devising a plan of attack for the next moonbow attempt.....stay tuned!